It's Facebook Fridays! 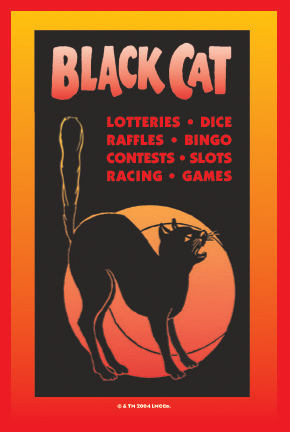 for October 6, 2017, and Halloween is approaching, so it's time to honour and celebrate black cats, and to appeal to them for gambling luck! 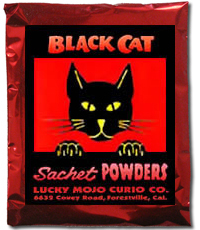 The Lucky Mojo Curio Company is holding a random drawing to give away 3 luck-drawing Black Cat spiritual supply prizes. This week each lucky winner will receive a beautifully dressed and blessed Black Cat Vigil Candle, along with a bottle of hand-made Lucky Mojo brand Black Cat Oil, plus a packet of Black Cat Sachet Powders. Use these traditional spiritual supplies for good luck in lotteries or card cames, or to decorate that "witchy" Halloween display you've always wanted to install in the folk art museum of your life. We have a winner! In fact, we have 3 lucky winners! Our Facebook Fridays! winners for October 6, 2017 are: Heather Peake, Issac Adams, and Jennifer Hummingbird Teixeira.